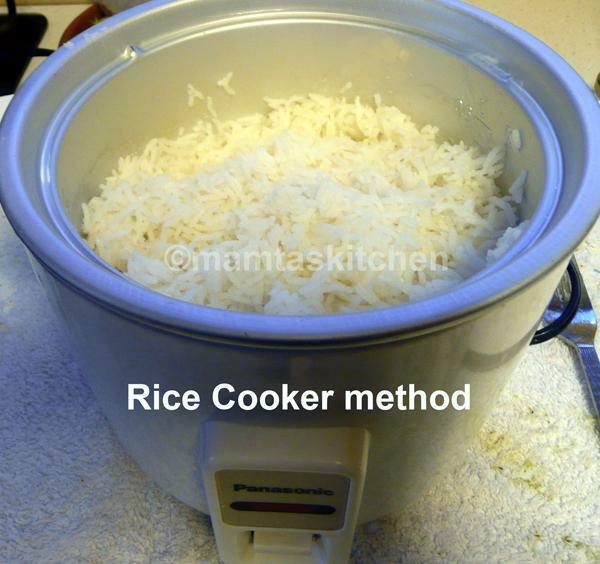 Mamta's Kitchen » Rice-How To Cook Rice perfectly? Rice-How To Cook Rice perfectly? Rice is eaten boiled for everyday Indian meals. It is one of the dishes that I get asked about most in my mail box. Many different types of rice are available in India, but Basmati is perhaps the best known one, at least in North India. Previous year’s, older rice is better than the ‘new’ rice. It is more expensive to buy than the new rice. My mum always saves some of the new rice for next year, for cooking on special occasions or for special guests. Adding salt or oil to water is not generally practiced in Northern India. 2 cups Basmati rice, approximately 1/3 cup or 60-70 gm. rice per person. My mum used to say, " one good fistful per person" and it works for me. Water-amount depends upon which method of cooking you use. Less water is needed if you have soaked the rice in advance. Thicker grains of rice need slightly more water, follow instructions on the packet. Clean and wash the rice gently in cold water, until water runs clean. This is to remove dust and excess starch, so the end result is not sticky. Some people say that soaking it for 30 minutes or so makes it longer and fluffier, but I am not convinced and don’t very often soak it. Just wash and leave it while the water is coming to boil. It probably reduces the starch somewhat. Before cooking, strain rice in a wire strainer or sieve to drain off all the water. If it is not drained fully after soaking for 20-30 minutes, you have to reduce the amount of water in which you are going to boil it. Otherwise, you will end up having soggy rice. Brown basmati rice takes longer to cook and needs more water. Follow instructions on the packet. Measure water-twice the amount by volume, which is 2 cups for 1 cup rice. For soaked rice, reduce it slightly, say 3/4th cup for 1 cup of rice*. Bring measured water to boil in a flat bottomed pan that has a tight fitting lid. 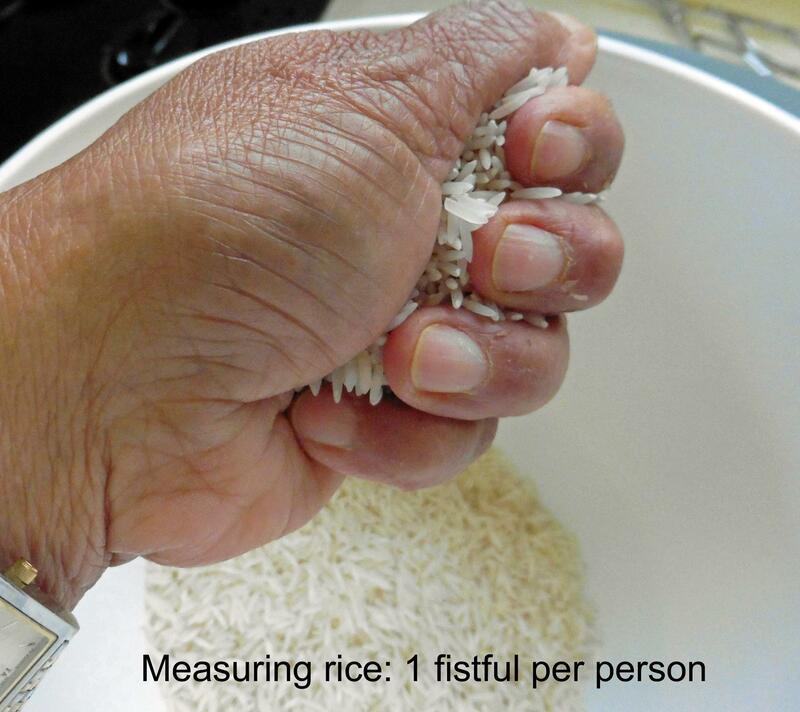 *If you don’t want to measure the rice or water, you can cook it in water approximately 1 inch/1½ to 2 finger’s width/up to 1st knuckle of the finger resting just above the level of rice in the pan. Bring water to boil. Add drained rice and bring to boil again. After about 20 seconds of brisk boiling/bubbling, close the lid and reduce the heat to minimum. Lid should be tight fitting. If you have an electric hob where it is difficult to reduce heat instantly, it is a good idea to have another hob on at minimum, and simply transfer the pan to this hob at this stage. Otherwise, it will keep boiling for longer and may need extra water. Cook for 10-15 minutes, on minimum heat, until all the water has absorbed. Do not keep opening the lid, keep peeking to nil or a minimum. I often cook rice in a glass lidded pan, so there is no temptation to open the lid. At the end of the cooking, when water is nearly gone or gone, open the lid gently and pick up a couple of grains of rice. To check if it is ready, squeeze the picked grains between your forefinger and thumb, no ‘grit’ should be felt. Some cooks prefer to leave one ‘grit’ when they turn the heat off, to give ‘al dente’ rice. If it has 2-3 ‘grits’ left when squeezed and feels undercooked, sprinkle a little water on top, close the lid and cook for further 4-5 minutes. Allow to ‘rest’ or ‘stand’ for a 5-10 minutes before serving. This makes sure that all the rice is evenly cooked. Lightly fluff up with a fork and serve hot with dal or a meat/chicken/fish/vegetable curry. Fluff it up before serving using a fork. Pasta Method, boiling the rice in a lot of water: If you want to reduce the carbohydrate content of the rice, boil 1 cup rice in approximately 5-6 cups of boiling water. Wash and drain rice as above. Bring water to boil and continue to boil briskly for 6-7 minutes, until rice is nearly cooked or one 'grit' is felt when a grain is pressed between finger and thumb. Turn heat off. Tip into a metal strainer and drain off all the water, completely. Indians do not run cold water on cooked rice, as it is almost always served immediately, fresh and hot. However, this is a good thing to do, if you are going to use the rice for a stir-fry, which requires cold rice. Runnigncold water will stop it from cooking further and getting lumpy. Transfer rice to serving bowl and cover with a lid. Allow to rest for 5-10 minutes before serving. Fluff it up with a fork. Microwave Method: I don’t use this method, because it doesn’t save time and if you go over even by a minute, you can ruin your rice. Microwaves have different powers and difference performance level, so the method below is an approximate guide only. Close the lid (or cover with a microwave suitable cling film, with 1-2 holes pierced for steam to escape). Cook on maximum (800-1000) 8-10 minutes. You will need to work out the exact time for your own microwave oven by trial and error a few times. If you are cooking larger amounts, you will also need extra time. Allow to rest for 5 minutes, then fluff it up and serve. Pressure Cooker Method; Indians of often cook rice in a pressure cooker. You need to add less water, 1 1/4 cup water to 1 cup of washed and drained rice. Place rice and boiling water in the pressure cooker. Close the lid and cook for 3-4 minutes under full pressure. Cool down the pressure cooker quickly by placing it under running water, ensuring that water is falling away from the steam vent. If you don’t cool it quickly, rice will continue cooking and will get mushy. You can cook another way in pressure cooker; boil 1 cup water in the pressure cooker. Place the ‘trivet’ in and then 1 cup rice and 1 3/4 cups water in a metal bowl on top of the trivet. Cover. Bring cooker to full pressure and then reduce heat to minimum. Cook for 4 minutes. Allow the pressure cooker to cool. Open the lid and take the rice bowl out. Fluff up rice with a fork and serve. Oven Cooked Rice; this is not a method I use myself very often, it just takes too long, but rice can be cooked in an oven, if you wish. Preheat oven to 180-200°C, 370-400°F. Wash and drain the basmati rice. Place in an oven suitable container. 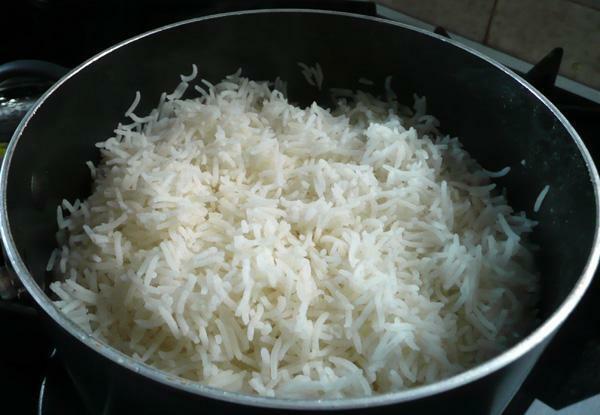 Add 1 3/4 cups boiling water to 1 cup rice, cover and cook 35-40 minutes in the centre of the oven. The pan should have a tight fitting lid, or your oven will get covered in boiled over rice water. Rice Cooker: Cook as per instructions of your rice cooker. Then switch it off just before it is ready. Let it sit for 5-10 minutes before serving. If you leave the cooker on, the rice becomes over cooked and sticky, especially towards the bottom, close to the heat source. If using other varieties of rice, follow instructions on the packet. Short to medium grain rice take longer to cook and brown/wild rice still longer, up to 40-45 minutes. Adding a teaspoon of oil/ghee to boiling water helps to keep the grains separate, but this not a common practice amongst most Indians. You can flavour the water with stock, salt, saffron, cardamoms and even herbs. Again, this is not a common practice in Indian households. Freshly boiled, steaming rice tastes very good eaten with a knob of butter/ghee and a good sprinkling of any brown or muscovado type of sugar or 'boora', the Indian raw sugar. They melt and seep into the rice and taste delicious! Serve it at the end of a meal. This is quite popular in North India, specially amongst children. This combination is very soothing to an upset stomach and easy to digest and it replaces some of the electrolytes. We Indians use it all the time. Travellers to India, remember it! What to do if your rice doesn’t come out perfect? If it has ‘caught’ or burnt at the bottom; Sit the pan in a sink of cold water. This will stop the rice cooking further. Then gently lift out the rice from the top, leaving the burnt bit behind. Taste before serving, to make sure that it doesn’t have the ‘burnt’ smell. Rice is undercooked and grainy; Sprinkle 2 tbs. water on top, cover and cook on minimum heat for another 5-6 minutes. Rice is beginning to get too soggy; Take the lid of and let it sit on minimum heat for a few minutes. Do not stir or it will break and become gooey! Alternatively, use it to make rice pudding, but only if you have not salted it first.